I have told here that I am working with a new design of Hello Kitty Booties. Well, I have finished two already and here they are. This is the first Hello Kitty with a white face I made. 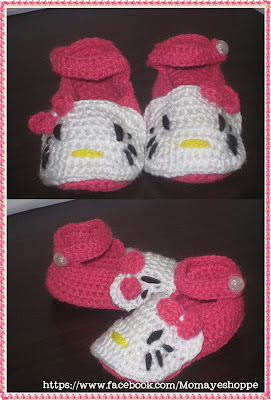 And this another Hello Kitty booties with black face. I am still fixing some glitches with the pattern I have done. Once I made it a little perfect then I will gladly share it with you. That's a promise. If I do forget it, please message me okay? Meanwhile, you can order a pair or two at Momaye's Shoppe. Just leave a message and I will attend to you as fast as I could. Honestly, I am having a hard time beating the MTO deadlines since some of my lovely clients order in bulk. 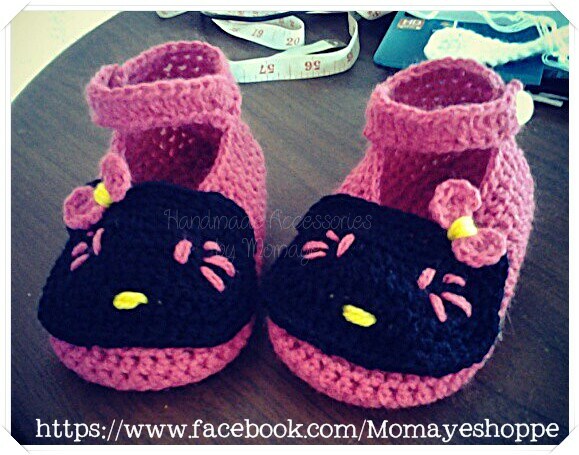 Imagine MTOs of 10+ booties for a client. I am figuring it out how can I apply the lead time if its bulk orders. Maybe I could adjust the lead time if it's bulk. What do you think? But I am very glad that my clients understand. Thank you so much fro the trust. Ang cute! Sayang my daughter is big na. Hi Dominique! It's actually crochet. I want to know how to knit too. But I just find it complicated since you need to hold two needles at the same time.